Cleaning your carpets is something that we all should do occasionally, but who really wants to haul out a huge carpet cleaner all the time? It can be quite a hassle to get everything out, clean the carpet and then put it all back. But with a portable carpet cleaner, you don’t need to worry about that. We’ve found the top portable carpet cleaners around so you can make sure you have everything you need to get your carpets looking great. Tank Capacity: How large is the tank that holds the water and solution? You want a tank that’s going to be large enough that you can get the entire area done at once without having to go back and refill it. Or you at least want to know. Size: How large is the unit itself? Is it going to be something you can move around easily or do you need some help? You want something that you can take out and clean with on your own without getting someone else to pull it out for you. Power: How much power does it use? This is going to affect your electricity bill so you definitely want to make sure you aren’t using too much power. At the same time, more power means it gets the job done better. Cord Length: How long is the cord that it comes with? This lets you know just how far you’ll be able to go before you have to turn around and unplug it. No one wants to stop halfway through a project, right? So make sure the cord reaches. Weight: How heavy is the unit? You’re going to have to carry it at least a little bit so you want to make sure you can lift it easily enough. That doesn’t mean it has to be super light, but something you can at least move. Warranty: What type of warranty is the company going to give you? Are they going to stand behind their product and make sure it works for you? Are they going to make sure that it lasts for at least a couple of years? There are plenty of carpet cleaners out there and actually plenty of great portable ones as well. We’ve found the best portable carpet cleaner for pets and some of the best Bissell portable carpet cleaner reviews and a whole lot more. So you’re going to be off to a great start when you get around to choosing your tools. 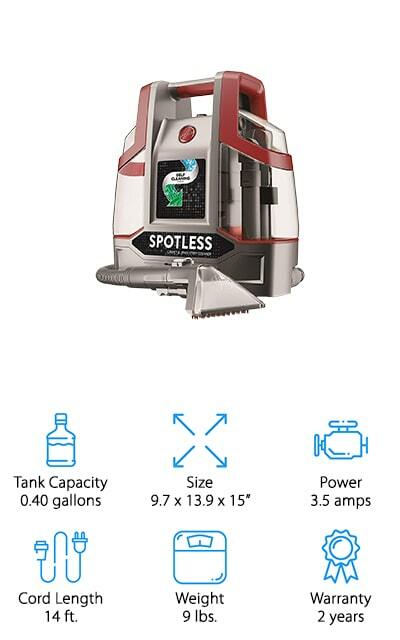 There’s a reason that the Bissell SpotClean professional portable carpet cleaner is the best portable carpet cleaner. First of all, it’s going to get rid of all of the toughest stains and spots that end up in your carpet. It also works on upholstery and stairs and rugs too, which means you can really get your whole house in much better shape before you even know it. You’ll get a 22-foot power cord and a 4-foot hose so you can easily reach anywhere you need to go without having to move around too much. You’ll also have a tank that holds ¾ of a gallon of water at a time. The 2-year warranty lets you know that you’re getting something you can definitely count on and that’s going to last. The company stands behind it, after all. Plus, it’s not too heavy for you to take throughout the house or even up the stairs. This is a company that you definitely know when it comes to carpet cleaning because they’re well known for their vacuum cleaners. 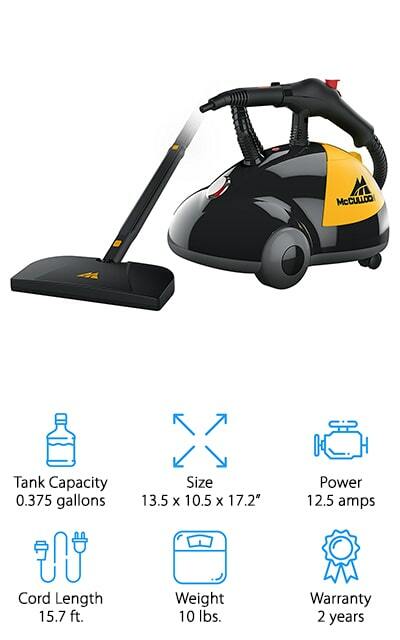 This one is super lightweight and small, which means it may take a little more time to get the job done but if you have small tasks it’s a lot more convenient. It’s also much easier to take up and down stairs or throughout a large house. With this one, you get a self-cleaning hose that will flush itself out to make sure there’s no bacteria or dirt lingering inside. It also has antibacterial protection throughout the multi-purpose tool. The dual tank means that you get 1 for dirty water and 1 for clean water, which keeps it a whole lot easier to fill up, empty out and even rinse when you’re done. On top of that, you’re even going to have a trial size of all the stuff you need to give it a try. This is our top-rated portable carpet cleaner, which provides you with plenty of power for absolutely anything you might need. 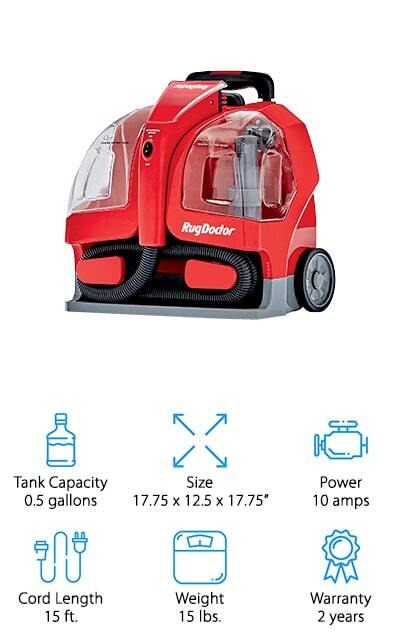 It has a 48-ounce tank capacity and has a hose and 15-foot cord. That means you can definitely reach further and you can count on the strong spray and suction. The cleaning and the drying are actually both done in a single step, so you don’t have to spend as much time cleaning your floors either. You’ll also have attachments that make the job even easier to do and a container and hose that’s PVC free. The entire unit has parts made from post-consumer recycled plastic, which means you can also feel good about the environment when you use it. There’s a 1-year warranty that lets you know you’re getting something you can trust to work. 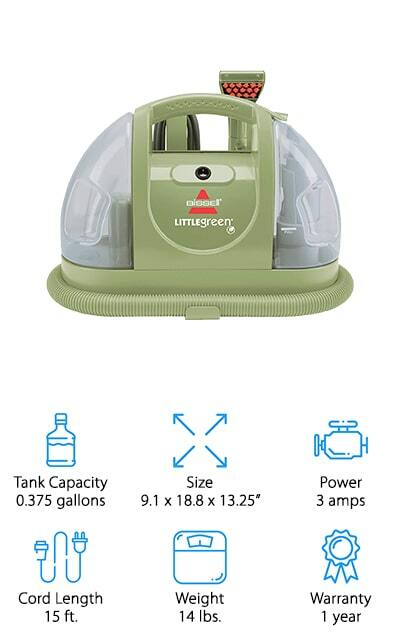 Check out our portable carpet cleaner review on one of the larger options available. This one has a 2-year warranty, which lets you know it’s going to last, but it also has a larger size that lets you get a whole lot more done. At the same time, it’s actually not very heavy and uses a moderate amount of power. It’s able to clean and sanitize without the need for harsh chemicals, which keeps your family a whole lot safer and healthier. 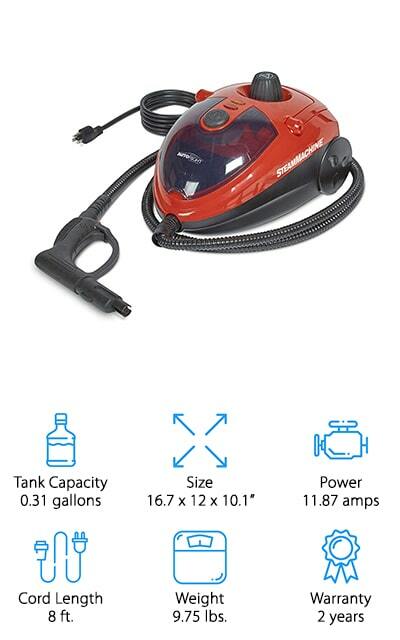 Within just 8 minutes you’ll have enough steam to clean for up to 45 minutes too. 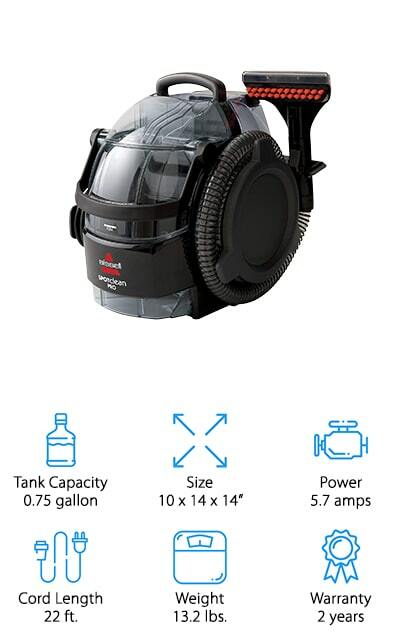 If you really want to get into the whole house and get a good clean this is the way to do it because it comes with 18 different accessories and a 15.7-foot power cord, plus a 9-foot steam hose. You’ll have no problem getting into corners, your upholstery and a whole lot more. Designed to take care of any kind of cleaning you might need and even wallpaper removal, this cleaner actually doesn’t use any type of chemicals or leave a chemical residue. All you need to do is turn it on and you’ll be ready to go almost instantly. It has a 6-foot cord as well as an 8-foot hose to help you reach and gives you continuous or intermittent steam. You’ll also have 2 extension tubes that help you reach even further and a 1-year warranty that lets you know this is a product that’s built to last a long time. Not only that but it holds nearly half a gallon of water at a time, making sure you get the job done. 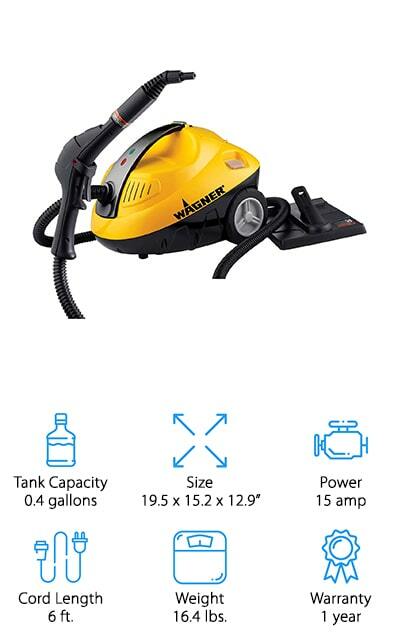 With this steam cleaner, you’re going to have plenty of size and power to take care of your house and you’ll have a number of different accessories that are designed to help you with your floors, furniture, windows, wallpaper and a whole lot more. This small portable carpet cleaner is great for anyone who needs to get into the carpeting on stairs, rugs, upholstery or even their vehicle. It has a deep stain remover through the handheld system for oscillating and more. You don’t need to scrub in order to get rid of the stains and you get a shorter drying time as well. The waste tank has a wide lid that makes rinsing and drying much easier and faster. Because it has a retractable handle and wheels that are designed to move on carpeting it gets where you want it and it moves easily. The 64-ounce tank holds plenty of water and the cleaner actually provides feathering from the spot so it will always blend in with the surrounding area. You’ll be able to remove anything from pet stains to coffee and odors and you’ll be able to use it anywhere you need it. 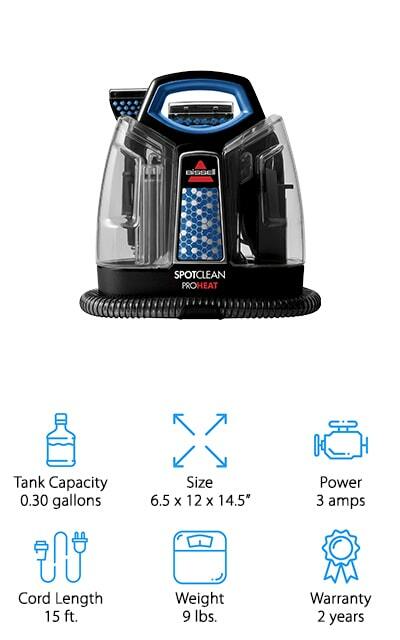 With this Bissell SpotClean portable carpet cleaner you’re going to have Heatwave Technology that’s actually designed to keep your water at the same temperature at all times while you’re cleaning. You also get a tool specifically designed for tough cleaning on stairs, upholstery and more. Each of the water tanks is easy to fill with water or empty when they get full of dirty water so there’s no problem getting the entire job done. All it takes is 3 amps of power to get it going and it’s lightweight enough that you’ll be able to take it upstairs and downstairs with no problem. There’s a 2-year warranty here that lets you know you’re getting something you can count on and it comes with everything you need to at least try it out. All you need to do is plug it in and you’re ready just like that. 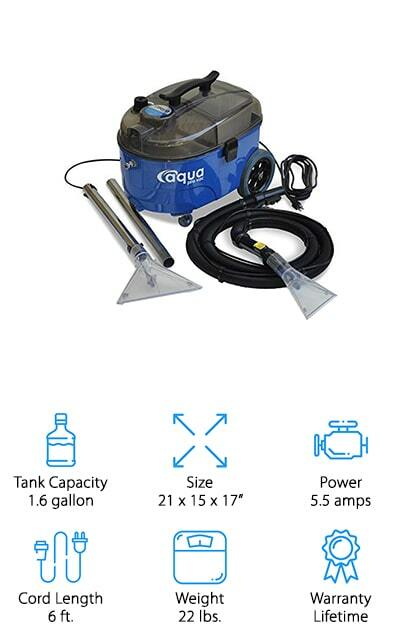 This professional portable carpet cleaner is a little larger than some of the other options, but it gives you a whole lot of power. It’s lightweight and uses very little power. Not only that but it has a tank large enough to hold all the water you need for the job to be done. You’ll get up to 45 minutes of continuous steam cleaning and you’ll have 11 different accessories that make sure you can get deep into the different stains and problems you have around your house without the need for any chemicals. 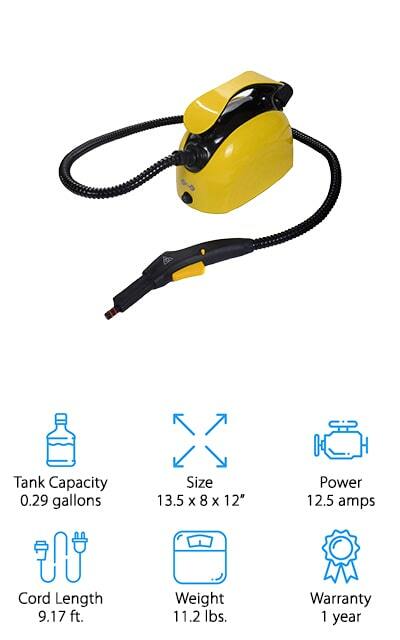 You’ll even be able to use this steam cleaner for your vehicle, so it’s more versatile than ever. The 2-year warranty will let you know you’re getting something you can count on to last and you can even use it on materials like leather, dashboards, and windows. If you’re looking for a large carpet cleaner that’s going to get a whole lot done then you’re definitely going to love this carpet cleaner. It actually has a tank that’s over 1 ½ gallons in size, which means you can get a lot taken care of quickly, without having to empty and refill the tank. It’s also a moderate weight, so you still don’t have to worry about carrying it along. It has a powerful spray of water and has a clear spray tool and floor tool so you can always see what it’s doing and how it’s working. Not only that but you get a more powerful amount of suction. This portable system has a handle to make it easier for you to carry and it has wheels that roll it along the floor much easier. You’ll even have a long power cord that makes sure you can reach as far as you need without adjusting the cord as you go. This inexpensive system is small and lightweight, which makes it far more convenient when you’re trying to work on smaller spots and areas that need a little help. It only takes about 6 minutes to heat up and then will give you plenty of power and steam to get through your next cleaning project, up to 25 minutes. All you have to do is carry it along and you’ll be able to travel throughout your entire house or you’ll be able to travel up and down the stairs without having to worry. There’s no reason you need to worry about scrubbing or even about chemicals because it’s going to be a whole lot easier for you to get stains out with just the steam. Your house will also be safer for your entire family and for all of your pets.